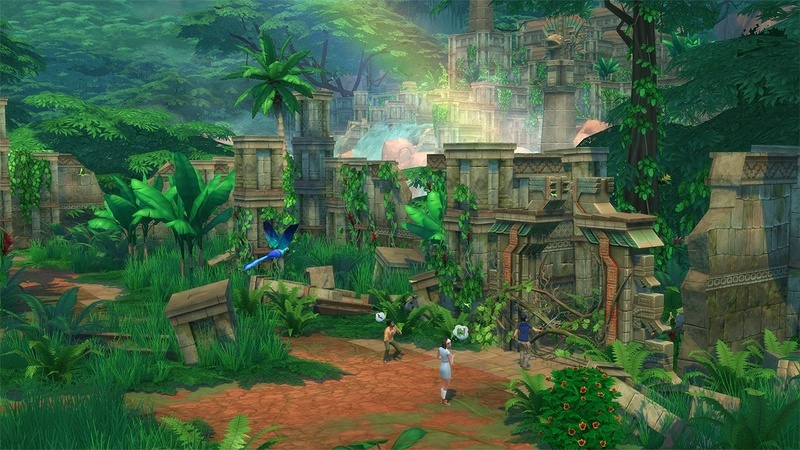 Explore a unique wilderness landscape, revealing a temple, jungle obstacles, cursed relics and treasures. Experience the culture and customs of Selvadorada, from devouring local eats to learning spicy new dance moves! Venture to Selvadorada. Travel to Selvadorada a new destination where your Sims can befriend locals at the cantina or purchase essential survival gear. 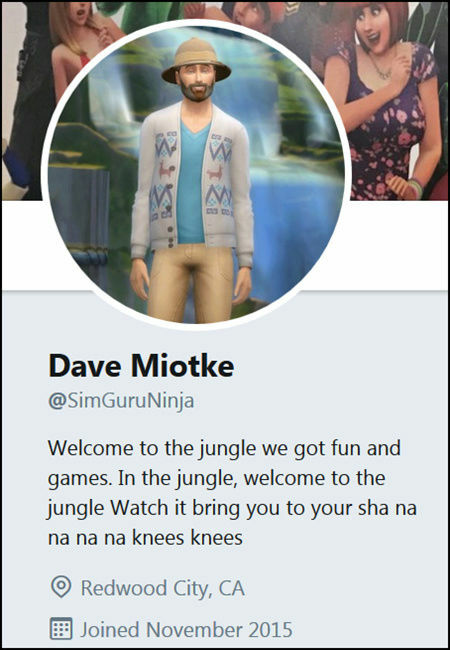 Your Sims can try traditional foods, dance to new music, practice native customs and shop for authentic décor. 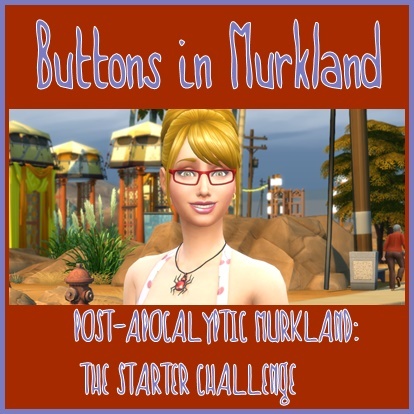 Dress your Sims in local fashion from outfits full of colorful patterns to durable clothing suitable for the jungle! Explore the jungle. 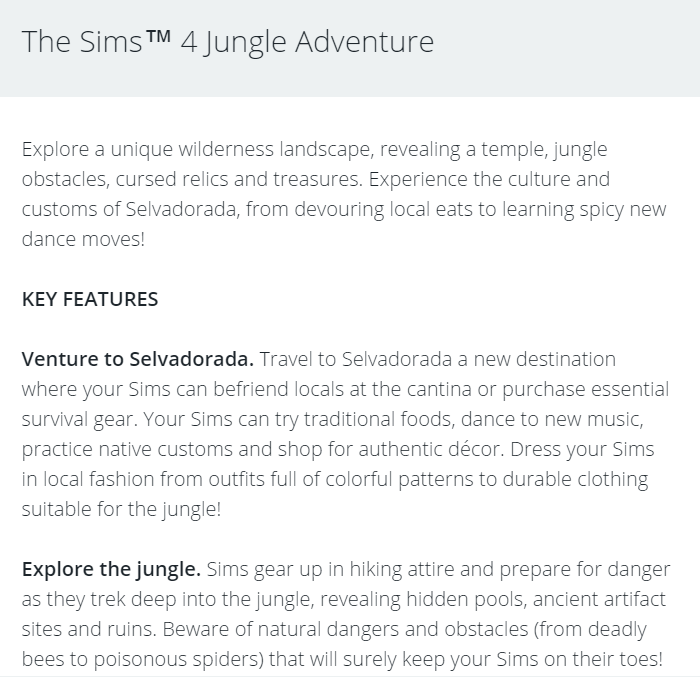 Sims gear up in hiking attire and prepare for danger as they trek deep into the jungle, revealing hidden pools, ancient artifact sites and ruins. Beware of natural dangers and obstacles (from deadly bees to poisonous spiders) that will surely keep your Sims on their toes! Discover a hidden temple. Your Sims will be pleasantly surprised with what they’ll find when they stumble upon a unique temple. Venture into the mysterious rooms where Sims may find priceless relics, great treasures or doom! 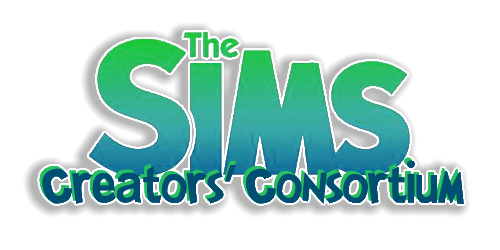 Have your Sims visit again to experience new challenges and uncover different treasures or traps. Collect ancient artifacts. 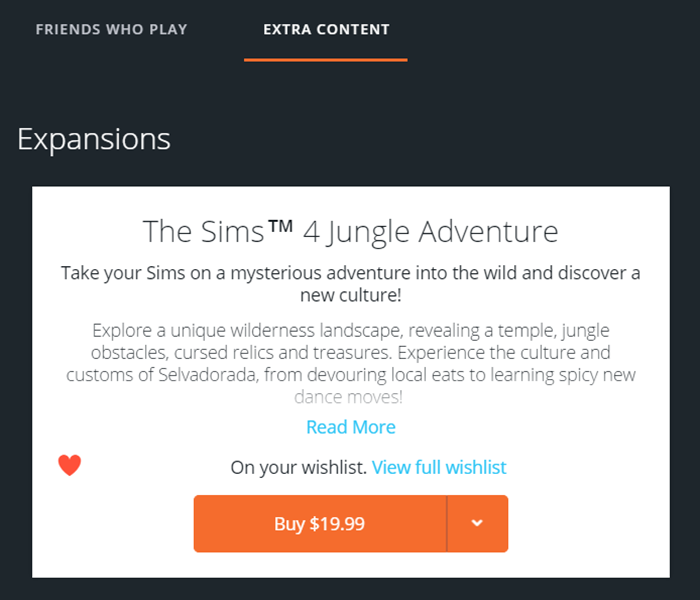 Uncover hidden items as Sims seek out ancient artifacts and mysterious relics. 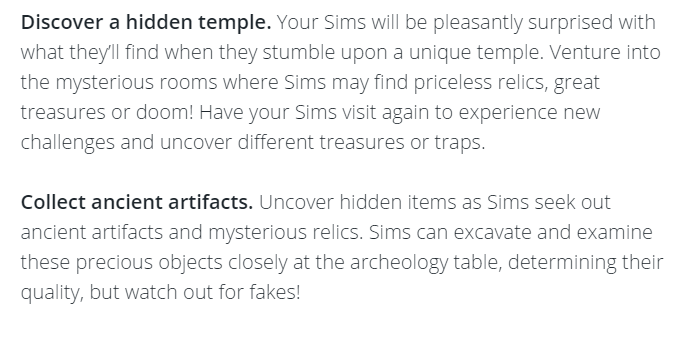 Sims can excavate and examine these precious objects closely at the archeology table, determining their quality, but watch out for fakes! Finally another place to travel/take a vacation! The information is no longer on Origin (glad I caught it). From what I have read it (info) was not supposed to be posted yet. 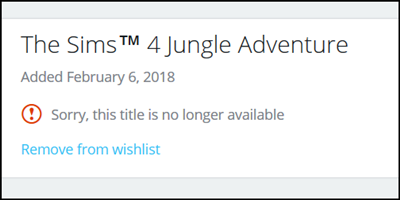 I had added it to my Wishlist but all that is left is a notice that it is 'no longer available'. Well, it looks cool anyway. Shared this reinvention of Valeda Tivona as Destiny Savage in JUNE 2017 I think she will be perfect for the new Jungle Adventure Pack. "It's a Savage world and it belongs to Destiny"
Original by #EQCreations - Renowned actress Valeda Tivona *IS* Destiny Savage! Valeda portrays Destiny Savage, a World Adventurer who sets out to explore the darkest most dangerous places on the planet in "Destined for Danger". Filmed on location in Al Simhara, Destiny is held captive by worshipers of an ancient deity. Will her fate be sealed by the Mummy's Curse? Or is MorcuCorp behind her misadventures? "Full trailer to come tomorrow according to the video. 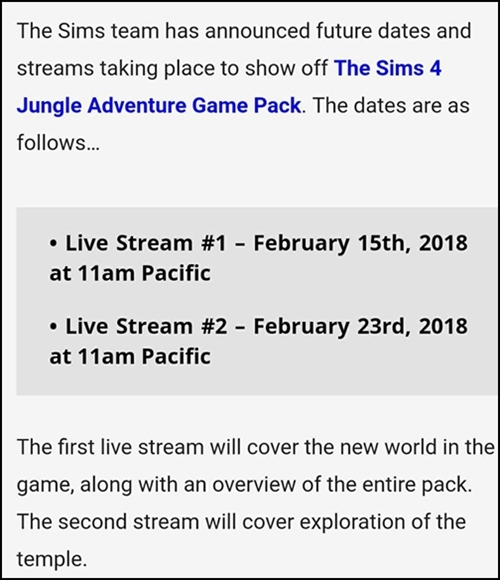 See here for more info: https://simsvip.com/category/the-sims-4/sims-4-jungle-adventure/﻿ "
The second live stream is Friday 23 February at 11am Pacific (2pm Eastern). 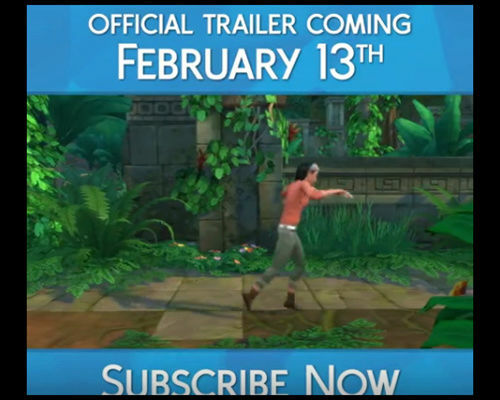 Looking forward to seeing the Temple exploration. 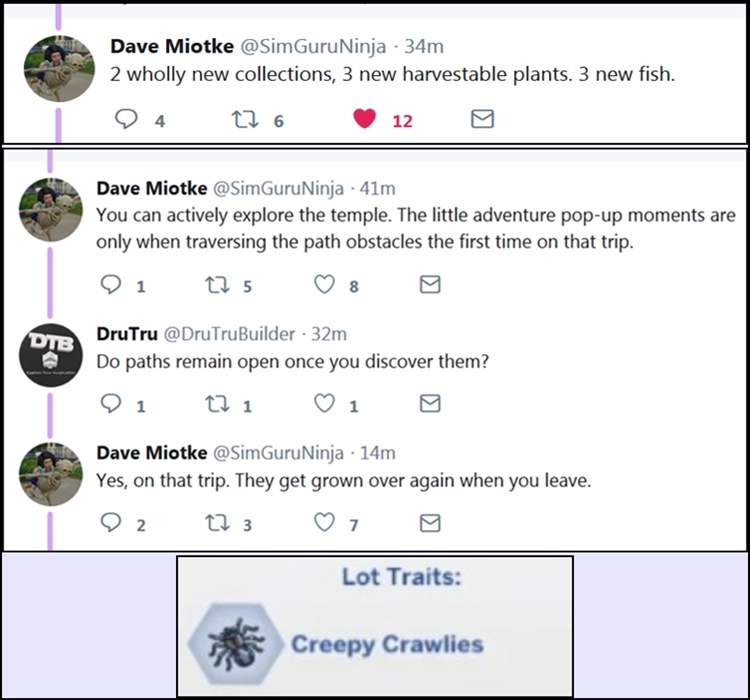 From what has been said so far the treasures and traps reset with each vacation back to the Jungle. Let us be your tour guide.